Mornings and nights are getting colder as we gear ourselves to welcome winter months... nice wholesome hot soup (plus chillies) .... is simply wonderful :). 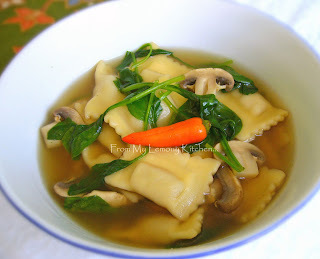 I think I would choose the Chinese dumplings to make this soup for a simple yet delicious lunch. Seeing the bird's eye chilli had my tongue wagging :-D It's fast and a comfort meal I would cook during those chilly winter too! I had something similar (without the chilli) with fried dumplings -gyoza style- added. I tasted 2 versions... vegetables and beef dumplings served with free flow of crispy fried chilli & dried prawn and julliened young ginger strips with black vinegar/chilli oil dips. This soup is full of wonderful flavours! Love to try this recipe soon. My initial intention to have this blog was to catalogue our food journey/journal .. so that my kids could refer to it when they are older.. so I try to keep it simple.. the photos are just to 'spice up' the blog... :). Nice.. I like this way of cooking! !